Most modern vaccinations are, of course, a form of chemical violence against children. If they were all formulated without chemical preservatives (like thimerosal) and dangerous adjuvants (which can harm the nervous system), that might be a different story. But far too many of today's vaccines are chemical concoctions that are entirely unnatural to the human body. To force them into the bodies of innocent children is an act of medical violence. The method of introducing the vaccines is unnatural and highly interventionist: These chemicals and DNA / RNA fragments are injected directly into the tissues and blood, bypassing the skin (a normal protective defense) and bypassing the digestive system, too. An injected mandatory vaccine dumps foreign material directly into the bloodstream of children without the consent of either the child or the parents -- that's what qualifies mandatory vaccines as "chemical violence" against children. The doctor in this parody cartoon was intentionally created to depict a "crazed" mad doctor because nothing turns an ordinary doctor into a mad man faster than an argument about vaccines. While he may seem to be a reasonable person on all other subjects, once you challenge him on the dangers of over-vaccination of children, all reason gets thrown out the window and he morphs into a raging lunatic of unscientific emotion. The complete lack of scientific evidence supporting the safety and efficacy of vaccines makes no difference to him. "Vaccines need no science," he'll say, "Because everybody knows they work!" Clearly if vaccines really worked, then an outbreak should have only occurred among those who were NOT vaccinated against mumps, right? But as I reported here on NaturalNews, 77 percent of the children who got infected had already been vaccinated! A similar truth emerges when you look at H1N1 deaths: Thousands of those who were vaccinated against H1N1 swine flu had already received the vaccine shots (http://www.naturalnews.com/027956_H1N1_vacci...). We still don't know the exact number of how many vaccinated people died because the CDC is hiding that data from the public, making sure the mainstream media doesn't learn the truth that even many of those who were vaccinated still died. What the CDC and its Big Pharma cohorts want people to mistakenly believe is that vaccines always offer protection against infectious disease. (100% protection). But this is blatantly false. In fact, because vaccines introduce a weakened virus into the body, they may hamper the normal immune response, creating systemic weakness that makes people more vulnerable to future infectious disease. In essence, weakened viruses create weakened immune responses, "training" the immune system to be more passive against future threats. That's why people who received vaccines in the past are far more likely to die of infectious disease in the future. Vaccine safety and effectiveness is "the Big Lie" of modern medicine in much the same that the WTC 7 building is "the Big Lie" of the war on terror. People who believe vaccines always work usually also believe the WTC 7 building was brought down by ordinary office fires. Yep: A hardened, military-grade structure made of concrete and steel somehow managed to collapse in perfect vertical demolition style due to a few ordinary office fires. This explanation is so laughably false that I question the practical intelligence of anyone who believes it... and yet lots of people believe it! These are the same people who believe that a hundred different vaccines are all good for you and that the drug companies are only looking out for your welfare. I've noticed a fascinating correlation between those who buy the official line on 9/11 and those who buy the official line on vaccines: These are the non-thinking people who are easily duped by anything the officials tell them. They could be told that the WTC 7 building was brought down by out-of-control office workers shooting rubber band guns in the hallway and they'd believe it! For office fires to have brought down WTC 7 in such a perfectly organized, vertical collapse, do you realize that these fires would have had to somehow melt or destroy all the support columns of the entire building at almost exactly the same time? That's the only way a building falls down vertically in such a controlled fashion: You have to blow out the support columns in a very carefully controlled split-second sequence. The odds of a fire accomplishing this are as close to zero as you can imagine... especially given that ordinary office fires don't even burn at the temperatures necessary to cause steel support beams to fail due to heat. So what does WTC building 7 have to do with vaccines? They both serve as a simple test of intelligent skepticism. The real Skeptics are the people who are skeptical of the official explanation of 9/11 and the cause of the collapse of WTC building 7. Real Skeptics are likewise skeptical of the vaccine-pushing agenda of the CDC and the drug companies. The real Skeptics think for themselves and ask intelligent questions like, "Why have no other steel buildings ever collapse from ordinary office fires in the history of the entire world?" Or questions like, "If human beings survived for hundreds of thousands of years without vaccines, developing highly effective internal defenses against infectious disease, then why are vaccines all of a sudden being pushed so hard given that the human gene pool has hardly changed over the last 10,000 years?" The non-skeptics are people who believe whatever they're told by authority figures no matter how ridiculous the explanation. Here, you need these vaccines shots because without them you might die! Irradiate your body with mammography in order to prevent cancer! Don't take vitamins or nutrients because they might hurt you! Instead, swallow these chemical medications -- they're GOOD for you! Once you combine the toxicity of vaccine adjuvants, chlorine in the water, BPA in plastics, non-stick cookware chemicals, antibacterial soaps and the chemicals in foods and medicines, you have a brain-numbing toxic stew that is now being spoon-fed to mainstream America. With their brains chemically suppressed by this onslaught of chemicals, most people find it impossible to think for themselves, so they go along with whatever they're told, oblivious to the truth that they are being fed daily poisons through the water system, the food supply, prescription medications and the mainstream media. Vaccines are just one more form of ammunition in the war to poison the People -- a war that's being waged by the corporations that rule our world. This war, like all wars, is extremely profitable to those who manufacture the bullets (or, in this case, the vaccines). The more people they can make sick -- or scare into thinking they might become sick -- the more money they can reap from the non-thinking public who will do whatever they're told. Do you see this hilarious pattern? More fear is now being applied to scare people into getting vaccines by implying they might die from terrorism if they don't get them! Now, those who refuse vaccinations are practically being called traitors to the American Empire. Will refusing vaccines soon get you arrested under the Patriot Act? But the vaccine pushers are in for a rude surprise: Vaccines ARE a form of bioterrorism! War has already been declared on the American people by the drug companies, and the weapons are the vaccines, the pharmaceuticals, the mammogram machines, the chemotherapy and other such weapons used by modern medicine. That's why this cartoon makes so much metaphorical sense: Vaccines are weapons! The casualty count of this medical bioterrorism being waged against the People won't be known for years... perhaps decades. That's because vaccines don't kill very many people right away. Instead, they eat away at your brain function and immune function. They compromise your ability to stay healthy in the future, thereby increasing your risk of death from future infectious disease. Remember: Viruses mutate all the time, but vaccines don't. The vaccine shot you get today for strain ABC won't save you next week when the circulating virus mutates to BCD. Only your immune system can save you from that, and your immune system has been "dumbed down" by the vaccines! The final body count from mandatory vaccination programs may eventually be in the tens of millions, but we'll probably never know for sure because people who die from the side effects of vaccines are never recorded as official "vaccine deaths." The coroners instead blame the more immediate elements such as "liver failure". We'll never know for sure how many of these deaths were actually initiated by vaccines which imbalanced the victim's immune function or caused long-term impairment to essential organ function. It is very likely, for example, that most of the people who died from H1N1 swine flu were recipients of previous vaccines. The role that those previous vaccines may have played in their recent deaths from H1N1 is not being acknowledged by any health authority -- they simply pretend there is no correlation between previous vaccinations and current immune system vulnerability. All it would take to see the pattern is a trip to the swine flu morgue: I'm willing to bet that the majority of those who died from swine flu were recipients of previous vaccines. The problem for them is that such an event has probably never happened. No healthy person with high vitamin D levels has apparently ever died from swine flu. In fact, it's safe to say that the number of vitamin D advocates dying from any flu (including seasonal flu) must be extremely small, even spanning the last several decades. That's because vitamin D protects you from infectious disease. Far better than vaccines, in fact. Vitamin D helps prevent cancer, diabetes and heart disease. It helps build strong bones and even plays a role in brain function. Vitamin D is the "miracle" solution for infectious disease that the world needs... and yet the CDC won't mention it! Why won't the CDC recommend vitamin D? The answer is simple: Because the CDC is the vaccine whore of the drug industry. And at the top of the list of vaccine pushers is, of course, Dr. Julie Gerberding, who previously led the CDC for nine years and is now suddenly the president of Merck's worldwide vaccine division (http://www.naturalnews.com/027789_Dr_Julie_G...). The CDC doesn't believe in nutrition. It doesn't believe in the human immune system (unless activated with a vaccine injection). It doesn't believe in anti-viral herbs or natural medicines. The CDC only believes in patented, FDA-approved Big Pharma vaccines, and that's what it's pushing no matter what. The CDC operates with scientific blinders that prevent it from acknowledging anything outside the world of vaccines and Big Pharma chemicals. Forget the science: Vaccines represent the cultist mythology of modern medicine. If the CDC were really interested in halting infectious disease, why wouldn't they go public with recommendations about sunlight and vitamin D? Why wouldn't the CDC empower people with the knowledge they need to protect themselves against virtually ALL infectious disease? Why would the CDC remain silent on the issue of vitamin D, knowing that their silence would doom tens of thousands of American families and children to death each year from preventable flu infections? The answer is because the CDC isn't really interested in public health. I used to think highly of the CDC, but after this swine flu behavior, I've come to see this agency for what it really is: The vaccine marketing division of the pharmaceutical industry. Instead of thinking that Merck and the CDC are separate entities, you might as well just call it MerckDC. The CDC is no more interested in public health than the tobacco companies are interested in healthy lungs. The leaders of this agency have but one mission: Push vaccines onto more people and thereby eventually land high-paying jobs with the drug companies. If you really want to protect yourself from infectious disease, all you really need is vitamin D, great nutrition, a healthy fitness level and the support of Mother Nature's anti-viral phytonutrients which are present both in everyday foods and medicinal herbs. You don't need the CDC. You don't need Big Pharma. You don't need vaccines and you sure don't need Merck. What you do need is to support your body's own miraculous immune system technology and let it do its job to save your life like it already has a thousand times over. And in terms of developing countries where misguided billionaires like Bill Gates are engaged in funding mass vaccination programs, what they really need there are mass nutrition programs. Nutrition, vitamin D and some basic public sanitation would end the infectious disease problems there far more effectively than vaccines. So why won't Bill Gates invest money in nutrition? Because he's a wealthy puppet of Big Business, just like the CDC, WHO, FDA and FTC. Teaching developing countries about nutrition and sanitation creates independence and empowerment. But teaching them to rely solely on vaccines leads to dependence and medical enslavement. Which path do you really think Big Business wants developing countries to take? You guessed it: The path of dependence on western corporations that reap huge profits from the suffering of third-world children. 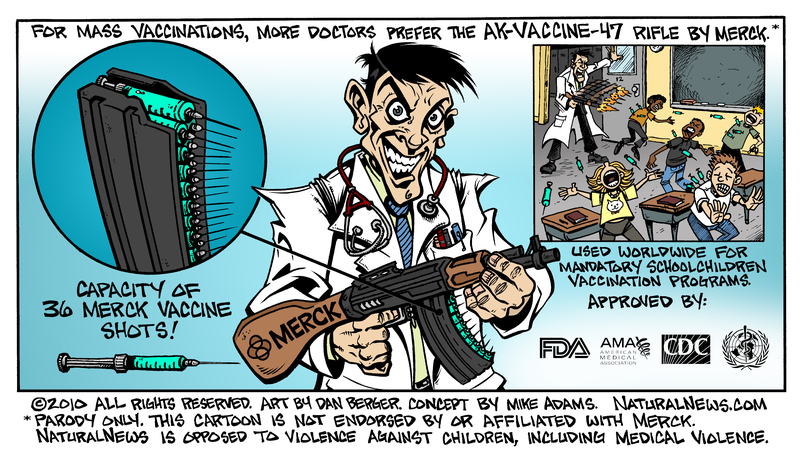 That's why this cartoon is such a powerful metaphor: Vaccines are weapons. They are weapons of control over both domestic and foreign populations. They are weapons that ensure a profitable financial future for the pharmaceutical industry, and they are weapons that are being openly promoted by the FDA, CDC and the WHO -- agencies with long histories of deep-rooted collusion with the pharmaceutical industry. Share this cartoon (and a link to this page) to help educate others about what's really going on with the vaccine industry. Permission is granted exclusively to all who oppose mandatory vaccines to use this cartoon in your book, website, documentary or other form as long as you include the complete cartoon (with the text below the cartoon intact) and provide full credit to Mike Adams, NaturalNews.com. If you use this on a website, please provide a link. Here's a hi-res version of the cartoon if you'd like to reproduce it for a book, magazine or film. The copyright of this cartoon remains with Truth Publishing.